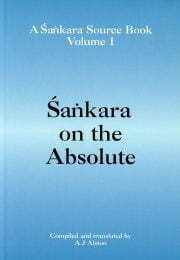 The Shankara Source Book contains writings by Shri Sankara, arranged systematically by subject. Shri Shankara was a great philosopher-sage who expressed the non-dual teachings in such a complete and satisfactory way that his formulation has been followed by authentic teachers of the non-dual tradition ever since. Most of his writings are in the form of commentaries on revealed texts such as the principle Upanishads, the Bhagavad Gita and the Brahma Sutras, so what he said was placed around those texts, which are far from systematic. His overall aim was to demonstrate that underlying the apparent contradictions and differences on the surface, all the great revealed scriptures in fact point ultimately to one Supreme Truth. He wished to do this in order to overcome the confusion that was causing hardship to the people at large, and creating difficulties for dedicated seekers. Shankara probably lived in the 8th century, and died in his early 30s. Shankara considered other views in great detail, sometimes provisionally accepting elements of their arguments, and then pointing out where those views lead to difficulties. One of the great qualities of the non-dual teachings as formulated by Shankara is that they are able to recognise and incorporate what is valid and useful in other views. Each passage is preceded by a note of introduction. The Shankara Source Book will be of interest to academic students and scholars of the non-dual philosophy as formulated by Shri Shankara. For dedicated practitioners of the non-dual teachings seeking inner illumination, it may sometimes be helpful to know exactly what Shri Shankara had to say on particular subjects, and it is relatively easy to find out in these volumes.